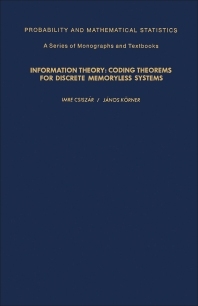 Information Theory: Coding Theorems for Discrete Memoryless Systems presents mathematical models that involve independent random variables with finite range. This three-chapter text specifically describes the characteristic phenomena of information theory. Chapter 1 deals with information measures in simple coding problems, with emphasis on some formal properties of Shannon’s information and the non-block source coding. Chapter 2 describes the properties and practical aspects of the two-terminal systems. This chapter also examines the noisy channel coding problem, the computation of channel capacity, and the arbitrarily varying channels. Chapter 3 looks into the theory and practicality of multi-terminal systems. This book is intended primarily for graduate students and research workers in mathematics, electrical engineering, and computer science.